It took until the final day of the regular season, but when the dust settled on the final standings in the Metropolitan Division a familiar match-up greeted Pittsburgh and New York. It'll be the third straight season that the Penguins and Rangers will meet in the Stanley Cup Playoffs and the second straight in the opening round. The Pens have lost the past two, once as a favorite to move on and once as the clear underdog, but their scorching hot finish to the season has them positioned as big favorites to move on to the Eastern Conference Semifinals. They'll need to get past Henrik Lundqvist to do so, as the Swedish goaltender has been instrumental in helping the Rangers advance the prior two times these teams met in the postseason. If there's one area where the Penguins have a decided advantage over the Rangers, it's in possession. While Pittsburgh was a below average team in driving play under former head coach Mike Johnston, they've been one of the best teams in the league under Mike Sullivan, and they've continued to get better with each passing month. As for the Rangers, they're the worst team out of the 16 that made the playoffs, and they've been trending down as the regular season came to a close. The Penguins and the Rangers are teams going in two different directions as for as scoring offense and defense go. Through the first part of the season under Mike Johnston, the Penguins were allowing roughly as many goals as they were scoring per game, which wasn't many, but under Sullivan they've managed to see a large increase in offense without harming their play in the own zone. While the Rangers started off with a great goal differential, they've seen similar numbers in goals scored and goals allowed per game in recent weeks. Not only were the Rangers the worst possession team among those that made the postseason, they had the highest 5-on-5 PDO at 102.4 in the entire league and one of the highest in all situations as well, suggesting that they've had more than their fair share of good luck. It should be noted though that as of late the Penguins have been on a hot stretch of play as well as far as their percentages go, and both teams will enter the playoffs with a similar track record over their previous 25 games. The Rangers had picked up right where they left off in the 2015 playoffs, shutting out the Penguins int their first meeting and keeping them scoreless well into their next game. 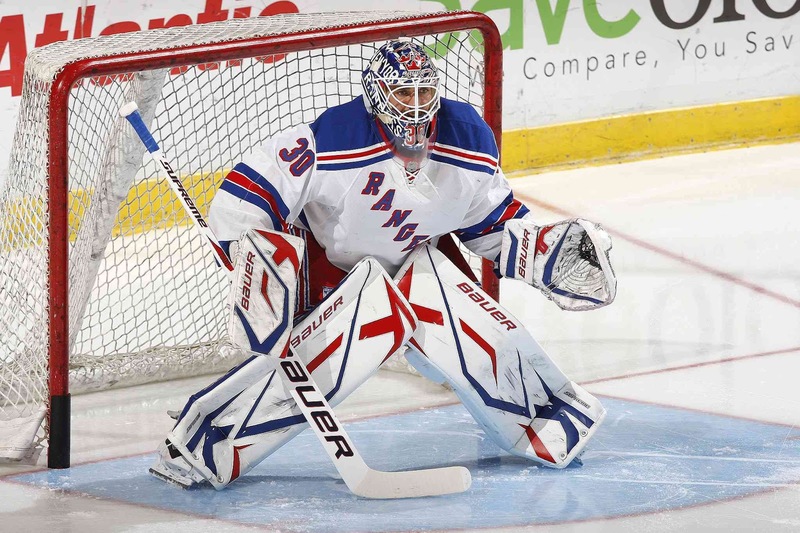 But then a funny thing happened - Lundqvist, angry at what he perceived to be a missed call when teammate Ryan McDonagh took him out, turned around and shoved his net off its moorings on the next Pittsburgh rush. The Pens would score 3 goals in 1:39 later in the period, and suddenly Lundqvist wasn't invincible anymore, as the Penguins would finish off the season scoring 10 goals against him in a little over 2 games worth of action. With Marc-Andre Fleury and Olli Maatta both getting in a full practice yesterday without any complications, there are likely to be a couple of changes to the Pittsburgh Penguins lineup before Game 1. Assuming Fleury is able to go, Tristan Jarry will almost certainly be returned to Wilkes-Barre, while Olli Maatta will force an interesting decision about who gets bumped out of the lineup on defense. The lineup should continue to undergo changes throughout the series as Evgeni Malkin, Bryan Rust, Beau Bennett, and Matt Murray are all day to day. For the Rangers, indications are that Dan Girardi will be able to return in time for Game 1, while Alain Vigneault has already ruled out Ryan McDonagh for the start of the series. The Rangers will be led by their star netminder, though it's worth pointing out that this has been a bit of a down year for Henrik Lundqvist. His 2.48 GAA is the lowest of his career, while his 0.920 SV% is the lowest he's finished a season with this decade. Either way, when the bar has been set that high, even a bit of an off season is still very good. If Pittsburgh can get either Fleury or Murray in net, they'll be able to match-up against New York extremely well in the goaltending department. Marc-Andre Fleury has posted slightly better numbers on the season (0.921 SV%; 2.29 GAA), and Matt Murray has posted extremely good stats (0.930 SV%; 2.00 GAA) though only through a small sample size of 13 games. Pittsburgh will hope they don't have to rely on Jeff Zatkoff at all during the series as it's a clear step down to their third goalie. Though he's appeared in just 14 games this year, Zatkoff's 0.917 SV% and 2.79 GAA belie his true talent level. On offense, the Rangers saw a trio of players finish the season above 50 points, and Rick Nash did not make the cut. The former first overall pick had career lows with 15 goals and 36 points while missing 22 games, but he wasn't particularly effective even when healthy. He's joined in the lineup by another struggling former top pick, Eric Staal, who the team traded for shortly before the deadline. It's been a rough time in New York for Staal, as he's managed just 3 goals and 3 assists in 20 games since coming over from Carolina. The New York offense is led by Mats Zuccarello (26g 35a) and Derick Brassard (27g 31a), and the two have combined to be a force on the Rangers' second line. Both players have enjoyed a career season this year as this marks this first time either had topped 20 goals in a year. Zuccarello set a career high with his 61 points, and Brassard's 58 points fell just short of his career best of 60 set last season. In fact, it was a bit of a surprising season offensively all around for the Rangers. Of the 5 players to hit 20 goals for the team, a third player hit the mark for the first time in his career as well, J.T. Miller with 22, Derek Stepan (22g) reached the 20 goal plateau for the first time since scoring 21 goals his rookie season in 2010-11, and Chris Kreider posted his second consecutive 21 goal campaign. The Rangers have good scoring depth in their lineup, but for the first time in a long time Pittsburgh can skate with anyone lines 1-4, and the one thing New York can't match is the top offensive talent that the Penguins have. Both Sidney Crosby and Kris Letang had slow starts to the season, but they rebounded nicely and have been on fire to end the year, each with matching 8 game point streaks. Crosby's run was good enough to propel him to 3rd in the league with 85 points, while Letang fell just short of a point per game production with 67 points in 71 games, which was still good enough to place him 19th in the league. Evgeni Malkin struggled with injuries in the second half of the season, but the Russian center had 27 goals and 31 assists through 57 games played and was instrumental in keeping the Penguins in contention as the team struggled under Mike Johnston earlier in the year. Phil Kessel (26g 33a) and Patric Hornqvist (22g 29a) add more fire power to the top of the lineup, as does a former Ranger. New York was forced to trade Carl Hagelin last offseason when they weren't able to meet his salary demands, and after struggling with the Anaheim Ducks he's caught fire since coming over to Pittsburgh with 10 goals and 17 assists in 37 games played. More importantly, he's developed great chemistry with Phil Kessel, and the two give the Penguins' second line a ton of speed on the wings, which Mike Sullivan has done a great job of utilizing. It was a Hagelin overtime goal that knocked Pittsburgh out of the playoffs in five games last season, and both the winger and the team hope that the shoe is on the other foot this time around.